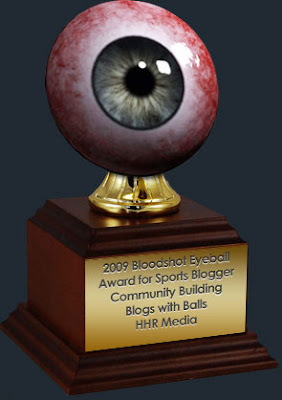 Blogs with Balls produced by the HHR Media Group. A couple of years ago, Don Povia and Kyle Bunch were sitting in a Mexican restaurant asking each other why there was not a forum/gathering for sports bloggers to get together to share their common interests and passions face to face. From that initial discussion, Chris Lucas joined the discussion and "Blogs with Balls" was born. What is most impressive about what HHR Media has done with this concept is not that BwB 1.0 took place in a dark basement pub in Manhattan. It is that with nothing but their idea and their gumption, they approached organizations like Sports Illustrated (si.com), ESPN, NESN, FoxSports.com and got them to come aboard as sponsors. They then lined up a roster of great panel members/speakers including mainstream media and media relations professionals like author Jeff Pearlman of si.com, Dan Shannoff, and Kathleen Hessert (President, Sports Media Challenge). On June 13, 2009 the gathering took place and by all accounts was a big success. Of course, many people could not get to Manhattan for this event. So what could they do to being the community and dialogue to them? The answer was simple, and Blogs with Balls 2.0 expanded to two days, and took place from October 15-16, 2009, as part of the Blog World and New Media Expo, in Las Vegas. Not only did attendance expand, but so did the speaker list, which included Jalen Rose, Rob King (Editor-in-chief, espn.com), Paul Fichtenbaum (Managing Editor, SI.com), and Ken Fuchs (VP, SI Digital). Topping off the event was a charity poker shootout to raise money for relief efforts in Darfur. HHR Media is not done yet, as BwB 3.0 has been set to take place in Chicago in June 2010.